A performance ringer tee to keep you in style. 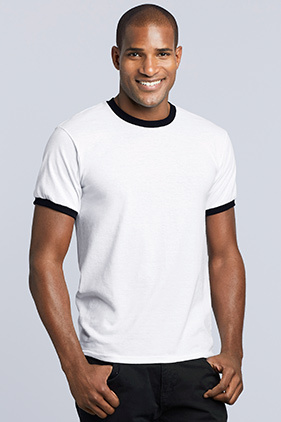 50% cotton/50% polyester 5.5 ounce preshrunk jersey knit ringer t-shirt. Moisture-wicking properties. Contrast neck and sleeve bands. 7/8" collar. Taped neck and shoulders. Double-needle bottom hem. Quarter-turned to eliminate center crease. Classic fit. Pad printed neck label and double-satin shoulder label. Transitioning to tear away label in 2019.